of your events via UGC. Le User-generated content (ou contenu généré par les utilisateurs) est un des principes fondateurs du web 2.0. Il consiste à renverser la conception d’une communication linéaire vers une interaction mutuelle, ici entre les consommateurs et les marques. On parle donc de tout type de contenu (texte, posts sur les réseaux sociaux, images, vidéos) venant des utilisateurs et non des marques/annonceurs. Ce contenu peut naître spontanément, comme un mode d’expression, ou peut faire partie d’une stratégie globale. Les marques peuvent, par exemple, lancer des concours en demandant aux internautes de poster une photo avec votre produit. 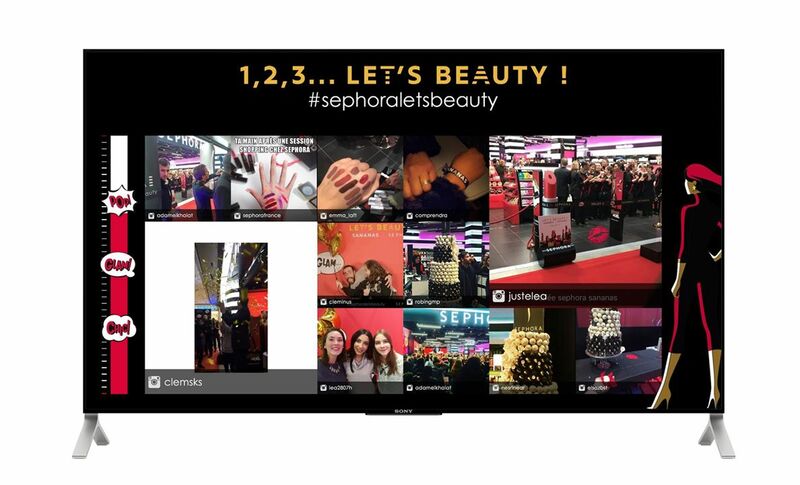 Découvrez comment Sephora a utilisé la technologie OuiBeat pour amplifier l’engouement autour de sa marque et inciter son public à interagir sur les réseaux sociaux lors dune inauguration d’un point de vente. Plus d’infos dans les projets. Content created by consumers themselves enjoys greater credibility. UGC is especially appreciated by consumers and promotes involvement and interactivity with the brand’s associated community. Internet users feel validated: they are no longer anonymous consumers but play a genuine role in strategic communication. According to a study, 87% of people say that UGC influences their purchasing decisions and 70% say that UGC is more convincing than traditional advertising content. As it gets increasingly difficult to capture consumers’ attention, UGC is an interesting marketing approach to engage consumers. Brands have improved awareness and results using a strategy that includes UGC. Among the most well-known brands, GoPro lets consumers share their adventures by using its products. This has made the brand’s consumers its best ambassadors and salespeople. Just like with any communication campaign, make sure your hashtag is not overused by other causes or too complicated to remember and use. It is also important to remind participants of the event on other communication materials and onsite signage. To encourage your visitors to create content about your brand, create forums for discussion, contests, photo challenges on social media, etc. Social walls are content aggregators that are a powerful marketing tool to encourage your visitors to interact and promote your event. Be reactive and constantly watching for content published online by participants. Use a content aggregator that will continually collect UGC content in real time from major social media platforms. Some will generate buzz – be sure to share the most relevant using a moderation platform. This also helps create genuine interaction with your target audience! An event is not just about the big day – it’s also about the lead-up (teaser) and post-event (highlights) experience. Let your audience extend the experience through new content on your website and aggregate all content on your web social wall. In addition to boosting brand awareness and results, UGC helps improve your offer. Through posted content, internet users will tell you how they’re using your product and what their expectations are so you can improve your services and products. Using the OuiBeat platform, you can also measure the actual reach of your event on social media and analyse the relevance of your chosen hashtags and social media platforms. The platform also lets you identify your main influencers in real time and showcase them via our UGC aggregators.